Next up in my Delicious Disney cookbook was some Maple Glazed Salmon with onion mashed potatoes. I was skeptical of this recipe at first glance. I like Salmon, but I’ve never been a fan of Maple Syrup and onion mashed potatoes made me quite concerned. Well this was a textbook example of why you should always give things a shot, and if you try something in the realm of food, you should always give it another shot. This recipe is all about the quality of your ingredients, which Disney always seems to try their best to deliver. This dish is offered at the Animator’s Palate on Walt Disney Cruise lines. Catherine and I only went on a Disney Cruise once (mostly because I thought I would hate being stuck on a ship). I was wrong about that, especially since we love to eat and a cruise is definitely a great place to get a bite. 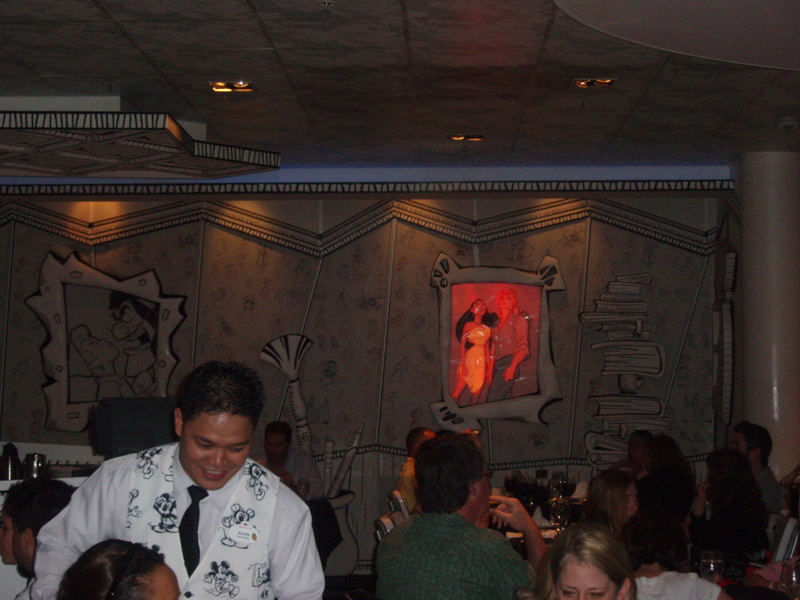 The Animator’s Palate was an interesting restaurant. 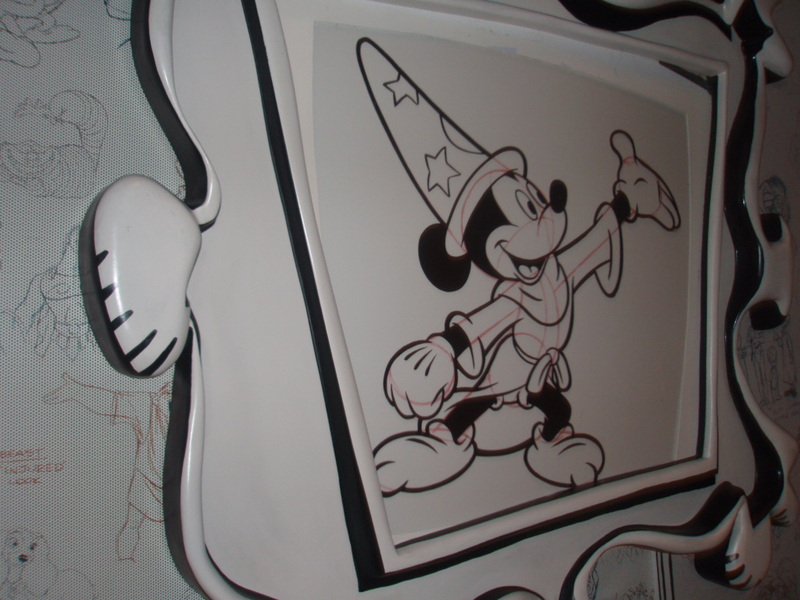 When you get there everything is in black and white; the walls with famous Disney drawings on them, the tables, even the wait staff. As you proceed through the meal, as you move from course to course, more color is added. The drawings on the walls start magically adding color as do the tables. 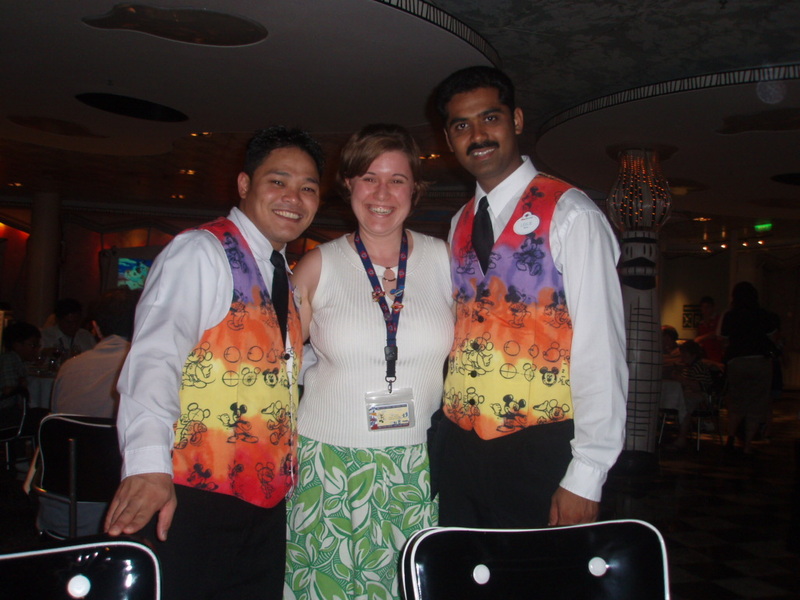 Even the waiters change uniforms throughout the meal; slowly changing into more colorful attire. At the end of the meal there’s even a surprise show. Getting back to the food, as I said, ingredients are the key here. Half the battle when cooking a meal is what you’re cooking with. No matter how good a chef you are, you are somewhat limited by the ingredients you have to work with. This doesn’t mean you always have to have top of the line ingredients, you just have to have quality ingredients. There is no point going out and buying a $30 per pound steak to cut up to make some Chili, the benefits of that cut of meat would be lost in the cooking method and strong flavors. In this recipe, the Maple Syrup is what can ruin your dish here. As I previously stated, I’ve never been a fan of “Maple Syrup”. Maple Syrup is in quotes because what I have been exposed to in the past was the fake stuff you find in most breakfast places in America. If you like it, there’s nothing wrong with that; it’s just too sweet for my taste. Since we are using this Maple Syrup to cover a delicately flavored meat in salmon, we need to make sure we have the real maple Syrup, the kind that comes from trees, not from a factory. 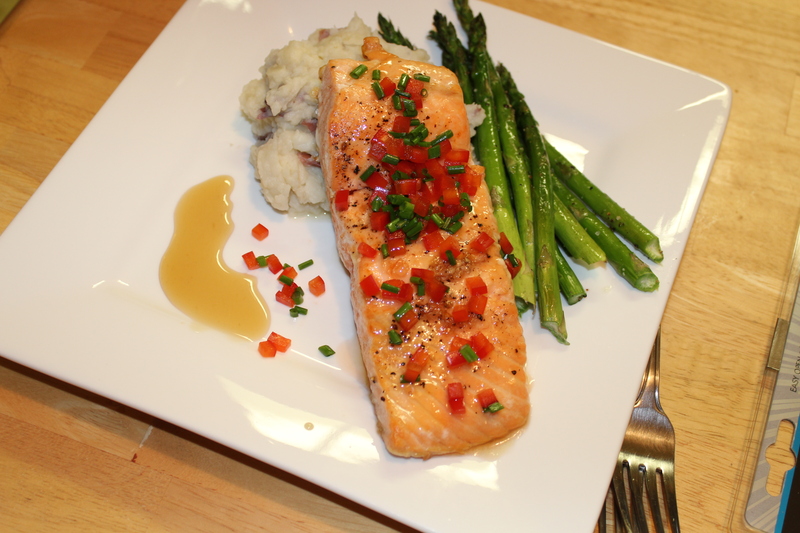 It’s not overly sweet and has a more complex flavor that complimented the Salmon. 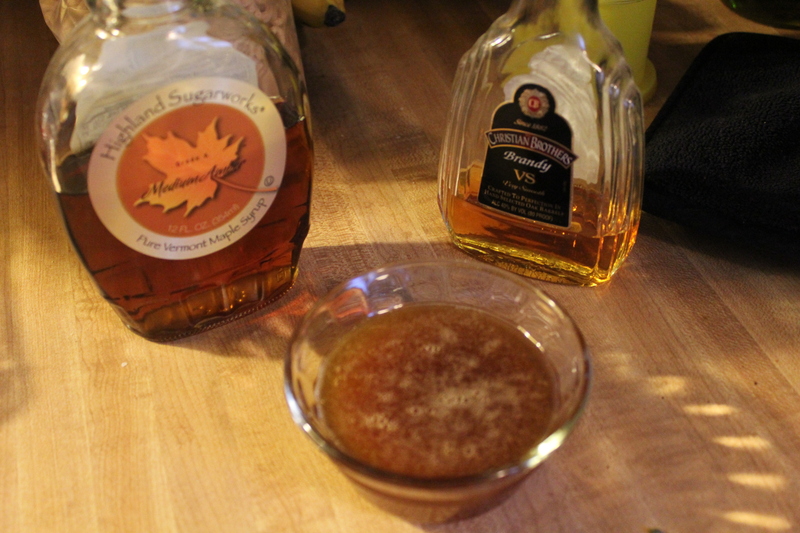 Maple Syrup and Brandy: Breakfast of Champions? I was also lucky enough that our favorite grocery store, Wegmans, had just received some Wild Caught Alaskan King Salmon. The opportunity to find this fish in Western New York has a limited window since we are obviously quite far away from Alaska. King Salmon is unbelievable. It has a wonderful flavor and is very buttery. It’s expensive but it is so rich that you don’t have to eat much to be satisfied. If I can get it, I usually get half a pound and split it between my wife and me. Unfortunately (from a cost-efficient perspective) my kids loved the salmon, so a half pound isn’t going to cut it anymore. 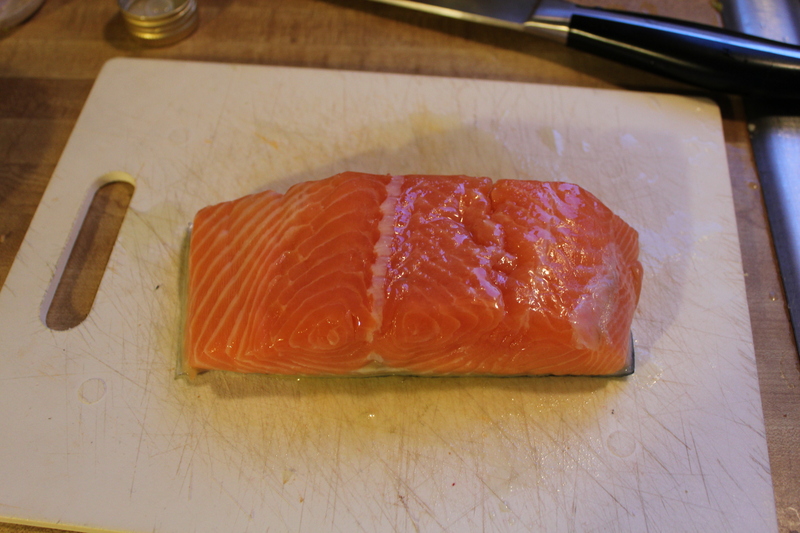 The Brandy Maple Glaze was fun to cook (you get to start the Brandy on fire) and did not overpower the Salmon. I did do one thing wrong; I used the glaze before letting it cool which meant I had to re-apply. I guess they told me to let it cool for a reason. Wild Caught Alaskan King Salmon, Yum!! The onion Mashed Potatoes were pretty simple. I used red potatoes, boiled whole. Sweated some onion and pureed it to a paste. I was concerned about flavor as there is a minimal amount of butter used. To my surprise, the potatoes were flavorful but not overwhelming in regards to the onion flavor. The bonus received from this was that we saved the calories and fat from the butter while not sacrificing flavor. We were all overwhelmingly pleased with this recipe; Will and Ariel kept asking for more. Catherine and I did not want to have to give them more of ours (we did though). The kids also liked the red pepper and scallion topping I made for the salmon that I mixed with a little Maple Brandy Glaze. We actually had quite a bit of the Glaze left over so we decided to try it on a different meat. We tried it on boneless pork chops and it was great. I would also suggest it as a topping for chicken but I would stay away from using it on Red Meat as the meat would overpower the Glaze. If you have any other tips or suggestions on the topics discussed, feel free to leave a comment so everyone can learn some new info!